Mini-Chris is now mobile. He figured out the whole crawling thing and now he picks his own destinations... At speed. He also has no fear response to speak of, a naturally high curiosity level, and enough intelligence to get himself in trouble. He also adores power cables and has left some very recognizable teeth marks in Daddy's laptop cable. He sleeps (maybe) 10 hours a day total. He's also sprouting teeth (usually in pairs) and has massive growing pains because he's now 33" tall. He's a big, active, trouble-making, smiling, happy baby boy who somehow survives on 10 hours of sleep a day. He's also a master at bending the laws of physics and the space-time continuum. There are days I want to call him Jack-Jack. His existence, however, does not erase the need for food, clean clothes, or various other realities of life for the rest of the family, nor does it erase my need for sleep. So content is kind of the last thing on my mind, way lower than keeping the kidlet from killing himself with his own curiosity. There will be video proof of the above sometime this century, as soon as I get some actual sleep. 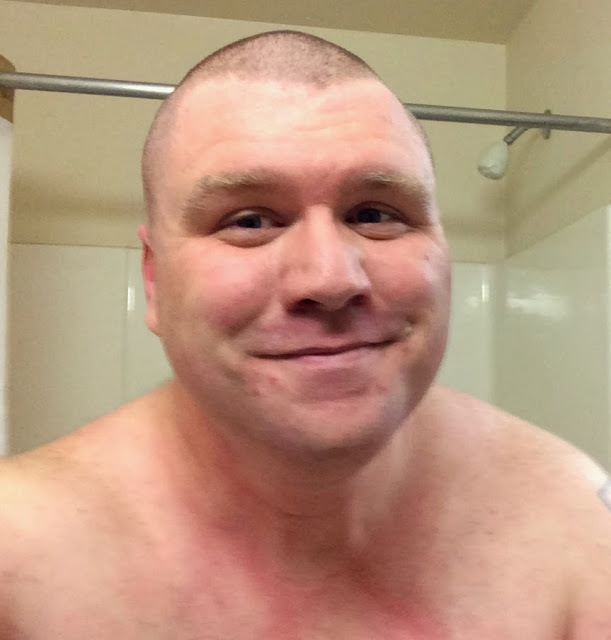 It's been about seven years since I've both shaved, and been at or below this weight. I broke my phone yesterday. The screen I cracked back in July (a few weeks after I got the thing) cracked all the way through the LCD this time. I AM going to have it fixed. The phone is functional except for the screen and it's $200 to replace that. No sense in NOT fixing a $700 phone. Unfortunately, I'm in the middle of moving and business travel, and it's going to be a couple weeks to get my old phone fixed. I can't go a couple weeks without a phone. So, I had to rush out and get a new one. Since I've already got multiple android devices (between us, I think Mel and I have seven or eight devices of some type, which run android in some fashion), and my iDevices are all several years old, I decided to grab an iPhone 5s (64gb black ). Given my job, I need to have a working iDevice around for testing purposes if nothing else. My old iPhones are VERY old at this point. Having been purchased in 2009 makes them dinosaurs, which can't run the latest iOs, and thus no longer useful for testing. I was planning on picking up an iPad mini at some point soon... but what the heck, here's an opportunity to get a new iDevice while filling another need. Verizon has a pay by installment plan that lets you keep your existing service plan (I'm well beyond my contract period, and have grandfathered unlimited data), so I DIDN'T have to lay out $800 all at once yesterday for a new phone, which is rather useful. In fact, because I have a discount plan, I ended up getting the phone, and a great accessory bundle worth about $200 (including a mophie Juice pack power station pro ), for a grand total of $200 up front. Unfortunately, I don't like the phone at all. In fact, I rather hate it both as a phone, and as a computing device. Oh, it's pretty... it's just stupid and broken, by design. I don't like how limited and simplistic iDevices are, even once jailbroken. I don't like being forced into Steve Jobs and Jony Ive's personal vision of "perfection". I like things the way I want them, not how Apple tells me I should want them. Even jailbroken, iDevices just don't do that. Even jailbroken, tethering is pathetic with an iPhone. You can't configure ANY options of any kind other than your WPA password. You can't even configure your SSID, as it's set automatically and unchangeably, to the host name of the phone. Worse, when you are using the iDevice as a hotspot, it doesn't participate in the hotspot network. It can act as a gateway, but you can't be tethered to it, and communicate with it directly at the same time. That is... universally, phenomenally, stupid and broken. ... but its "simple" and "elegant"... after all "users shouldn't have to think about those sorts of details and techy stuff, they just want it to work when they hit the button". Yeah... I want it to work... and I want it to work in situations OTHER than what apple thinks will be common. So, when I get my android phone fixed, I'm switching back... and I will have a very nice media streaming, game playing, and testing device. We ran an awful lot of miles in those six-ish weeks. We started the trip at 31209.5 miles... 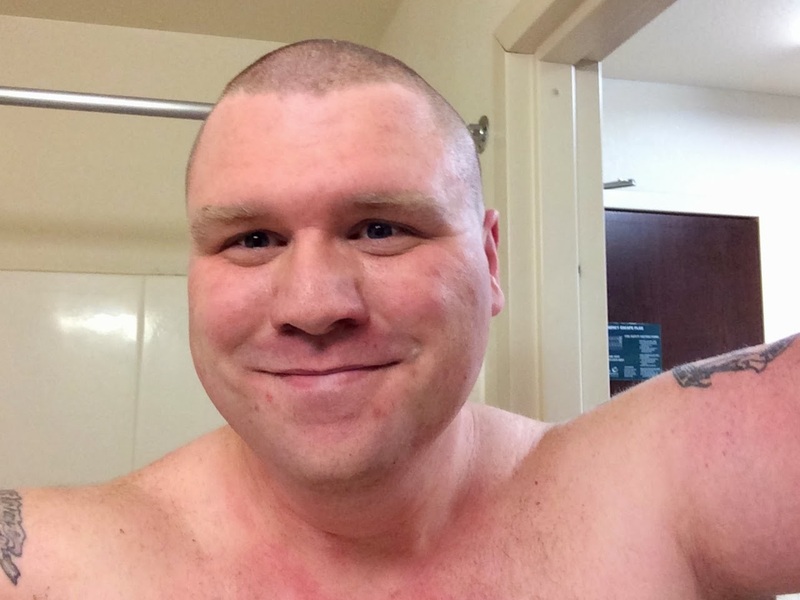 I took a pic of it, but apparently deleted it. Then, we spent the next month driving to hell and gone over New England, from Northern New Hampshire to Connecticut and most points in between. We had managed to drive 2677 miles. 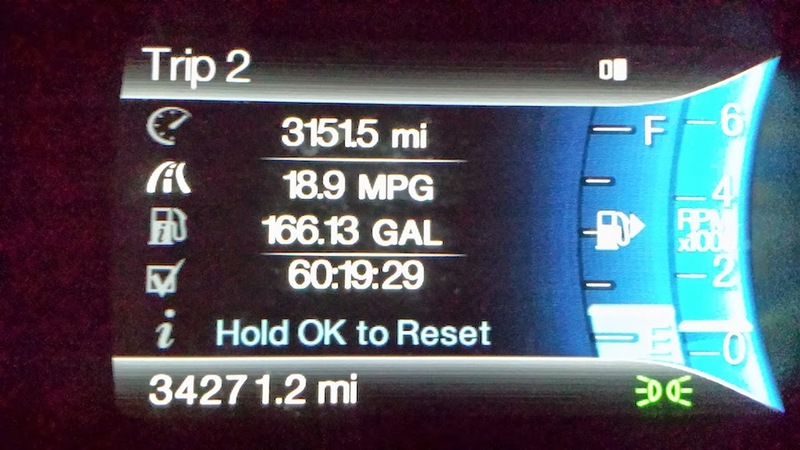 Total milage, 3071, total time 6 days, 8 family members and 11 friends visited. 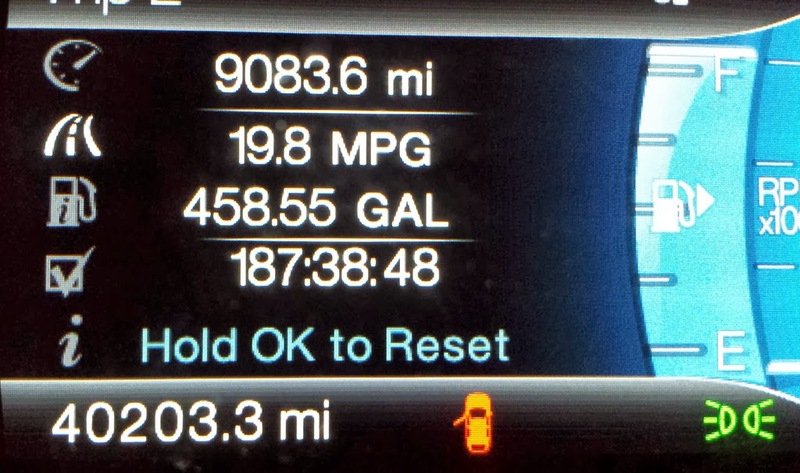 Having driven 9083.6 miles total, using 458.55 gallons of gasoline (an overall average of 19.8mpg, though we generally got around 20-22 on the highway. The lowest price we saw, $2.92. Highest, $3.79). According to my expense calculations, we paid an average of $3.20 per gallon, so we spend about $1500 in fuel alone. ... and THAT is a major reason why we didn't want to take our own truck for the housefinding trip. 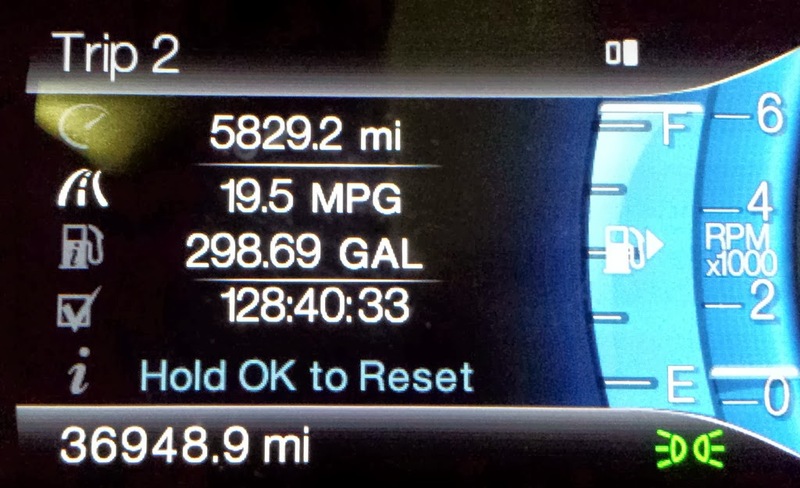 Another 9k in mileage and maintenance aside, we would have averaged 16-17mpg of diesel (we avg over 20mpg highway, but city and idling with the heater on aren't great for diesel mileage), which is $0.50-$0.60 percent more expensive per gallon. 535 gallons of diesel at $3.80, that's more than $500 extra in fuel alone. So, we haven't actually died on the road, nor have we taken over two weeks to get from New Hampshire to Arizona... Mel and I were both hit with the flu, while we were on the road... which is always a joy; and have had a hard time shaking it off. After the nightmare that was the trip out, we had decided we were going to try to relax more on the way back. Unfortunately, we left a couple days late because of work, throwing all our plans in disarray... and then the flu. The first "day", we ended up not actually leaving North Hampton, NH til Midnight Sunday morning. It's surprising how well the new Explorers (that's what we rented for the trip) handle, and the V6 has a fair bit of grunt. I took advantage of the clear weather, and clear late night roads, and we made pretty great time all the way out to western New York. We didn't actually get on an interstate at all until Schenectady; so about 200 miles on backroads at the beginning, and the last 40 were on state routes and county roads. Shortly after dawn Sunday morning, we stopped for the day at a friends place off to the west of Rochester. Mel had slept along the way, so she hung out while I slept for a few hours. Once I got up, we went out to a great dinner with four friends we hadn't been able to see in person in a number of years. Again, we didn't head out til quite late... around 11:30pm, but that was part of the plan. Well... 10pm had been part of the plan, but dinner with friends ran a little long. That said, we had made great time on late night back roads and deserted interstates, and figured we'd be able to do so again. At one point, while stopping for gas in eastern Ohio, we actually slid down an entire off ramp, across the intersection, and partway up the onramp opposite. So yeah, for safeties sake we decided to stop for the night at that point, and only made it to Cleveland (230 miles). That mean an extra 140 or so miles to reach Mels aunt and uncle in Macomb Illinois on Monday (580 miles). Did I mention that I was working the whole week? Yeah, I would work in the morning, start driving in the afternoon, and finish up my day before getting to sleep for the night. So, the ice cleared up around noon, and we grabbed lunch, and hit the highway again, for what was actually our first long stretch on the interstate during daylight. We made it over to Gary.. actually Hammond, Indiana (345 miles) by dinner time (well... 7pm), and had a semi-famous smashed burger and a shake at Shoops (pretty good burgers and shakes actually... thus why Shoops is semi-famous). The 225 non-stop, and mostly non-interstate miles from Hammond to Macomb (driving right by "Ron Swanson actor Nick Offermans home town of Minooka) took almost 5 hours, most of them white knuckle icy miles in limited visibility at reduced speed. At one point I watched a pickup truck actually spin on the road in front of me... and recover, managing to drive off safely. We finally pulled into Macomb a bit after midnight, and managed to get a good nights... well, 7 hours or so, which for me is a lot... sleep; and had a great morning through early afternoon with Mels aunt and uncle, their who's about Mel's age, and her cute little daughters. We left Macomb about 2pm, and were planning on hitting Kansas City (about 300 miles and almost none of it interstate) for dinner and to visit with Mel's middle brother and family, but we couldn't work a schedule out, and decided to push on to Topeka (360 miles). We could have easily made it to Salina, but this being new years eve, we didn't want to be on the road too late, and settled in to our hotel abou 10pm, again to get a good night sleep, prepping for the longer push to Colorado Springs the next day. We left the hotel 10am new years day, heading for a lunch meetup with my good friend of 10 years, Jeffro of the Poor Farm. By the time we made it to Hays, the ice and snow was blowing hard. The only good thing about the combination of 30 knot winds, heavy snow, and 12 degree temperatures, is that the wind is too high for the snow to on the highway. I've really got to stop saying "if the weather holds". Every time I do, it doesn't. We ended up spending about 2 hours sitting out the heaviest part of a mini-blizzard in Hays Kansas. You know the snow is bad when you go in for lunch clear, and come out an hour later to 4" on your car. You know it's REALLY bad when by the time you finish clearing the car, you've got to go back and clear where you started over again. We had to get back on the road to make sure we made our hard deadline of Colorado Springs that night, and the snow started to let up, so we set off around 3pm from Hays (about 320 miles, and a time zone change). It cleared up about an hour out of Hays, and we managed to stay clear for... oh, all of about 2 hours. This time it was so bad that they actually closed I-70 down around us. The ice was so bad on the grade up to Limon, that a bunch of vehicles slid off the road. Literally, as we were pulling off the Interstate into a truck stop in Limon, the troopers were closing the interstate for 20 miles both sides of Limon. Eventually they closed it all the way from east of Limon, over to strasbourg, on the approaches to Denver. ... only we were heading downgrade into the springs along 24, so lucky us, we could keep going. 24 was not significantly distinguishable from a luge run, and that's all I'll say about that. Hypoxia aside, we had a great day in the springs, stayed longer to extend our time with some family... I may write about that in the future... and so I could get some work done. Our original plan was to leave relatively early, and make it one long day to our endpoint in Arizona. We ended up not leaving Colorado Springs quite late, so changed our plans, deciding to stop for the night in Santa Fe (335 miles), so we could have dinner and hang with another friend. As an aside, I can recommend the Santa Fe Bar & Grille, we had a great dinner there, with excellent service, and a great beer selection. I can also VERY STRONGLY recommend Tecolote Cafe. It's honestly one of the best places I've ever eaten, and it's cheap, with amazing customer service to boot. Again, I worked til about 3pm (in the aforementioned cafe in fact), and then we ran down to Mesa (460 miles), getting in around 11pm. So, being sick the whole time, and having to work 'til the afternoon most days, not great. Being stuck in ice storms almost every night... really not great. Being able to take our time, visit and relax and hang out with friends and family we haven't seen in years... really great.